Using an Instant Pot makes this process easier when it comes to keeping a proper temperature for fermentation, but you can also use a simple glass jar in a warm area of your home for similar results. I’m still in minimalist-mode after living in tiny apartment kitchens for so long in Los Angeles, so I aim to keep my kitchen appliances to a minimum. That’s why when I decided to finally take the plunge and buy the Instant Pot, I wanted to get the model with the yogurt-making function, so it could multitask. Using the yogurt function did NOT come intuitively to me, but I finally figured out a one-pot method that makes the yogurt-making process as easy as possible. I tried using tapioca starch first, but I found it difficult to achieve the results I wanted. I needed to use about 1/4 cup of tapioca starch per 2 cans of coconut milk to get the thickness I was looking for, and the resulting mouthfeel was a bit “off” to me. If you’ve ever tasted store-bought yogurts with a lot of gums and thickeners, the tapioca-thickened yogurt reminded me of that. To keep this dairy-free yogurt vegan I decided to use agar agar flakes instead. If you’re not familiar with Agar Agar, it is a dried seaweed that acts very similar to gelatin. I bought in the “exotic foods” aisle where they sell Nori sheets for making sushi in my local Whole Foods, but if it’s not available to you locally you can also order it on Amazon. One bag will last you quite a while, and you can use it to make other recipes like my Vegan Strawberry Cream Pie or Vegan French Silk Pie. 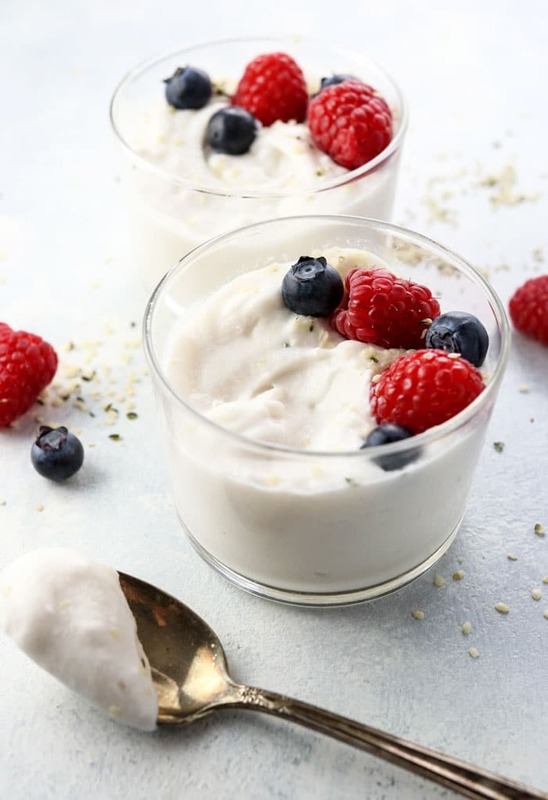 There’s also the possibility of using no thickener if you want to use straight coconut cream (the part that thickens up when chilled in a can) to make your yogurt instead. I don’t care for the taste or texture of the yogurts made with only coconut cream, as I think they taste too rich and fatty, but feel free to go that route if you’d like to. 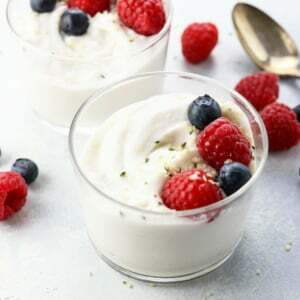 As written, this coconut milk yogurt recipe produces a very thick result, similar to a Greek-style yogurt, thanks to the thickener and fat content of the full-fat coconut milk. The yogurt will be very thin and runny when it’s in the Instant Pot fermenting, but it will thicken up perfectly once you transfer it to the fridge to chill. Make sure you sanitize everything well before getting started. Usually a dishwasher can sanitize everything for you (mine has a sanitize setting) but otherwise you can use boiling water to sanitize the bowl of the Instant Pot and your whisk. I could never get the “boil” function on the Instant Pot to actually make my coconut milk boil. Maybe it’s just my machine, but I thought I’d share. I read that you want the coconut milk to reach 180-degrees Fahrenheit to make sure no bad bacteria develops, and when I used the “boil” function that is built into the Instant Pot, my coconut milk never reached higher than 150ºF. So, to get around that I realized I could simply use the “Saute” function instead! The saute function brought my coconut milk to a boil in just a few minutes, and the temperature on my thermometer shot past 180ºF once the milk reached a rolling boil. So, if you don’t have a thermometer, I think it’s safe to assume that if your coconut milk reaches a rolling boil, it has safely reached that 180ºF mark. Be sure to set your Instant Pot’s yogurt function for longer than you need, just to be on the safe side. While testing several batches of yogurt, I think the sweet spot for getting a tangy yogurt is about 18 hours of fermentation. However, you might not always be home when the 18 hours are up, or you might be sleeping, so if you set the Instant Pot for only 18 hours it will turn off the warmer when the timer goes off. I’d hate for your yogurt to spoil while you’re out of the house or sleeping, so set the timer for at least 24 hours, or a time that will ensure you hear it beep when it’s done. That way you can check on it and transfer it to the fridge when you are satisfied with the tart flavor of your yogurt. The maple syrup called for in this recipe is required as food for the good bacteria to thrive on (so don’t be tempted to skip it! ), but when you let it ferment the yogurt becomes very tart– so don’t worry about the sugar content in that maple syrup. If you want a sweet yogurt, you’ll need to add more sweetener after the fermenting process is complete. What does Coconut Milk Yogurt Taste Like? I think it’s also important to note that if you don’t care for the taste of coconut milk, you probably won’t care for the taste of this yogurt. It definitely tastes like coconut milk, though you can adjust the flavor however you like when it’s done fermenting, either by adding some sweetener or fruit. Coconut milk can also have a slightly grainy-texture from the desiccated coconut, so don’t expect the coconut milk yogurt to be quite as silky-smooth as dairy-based yogurts are. I have been enjoying this yogurt served with my Grain-Free Pumpkin Seed Granola as quick breakfast or snack, so I hope you’ll enjoy this probiotic-rich yogurt just as much. I think it tastes similar, if not better, to the store-bought brands and costs just about $1 per serving, to help fit into your healthy eating budget! 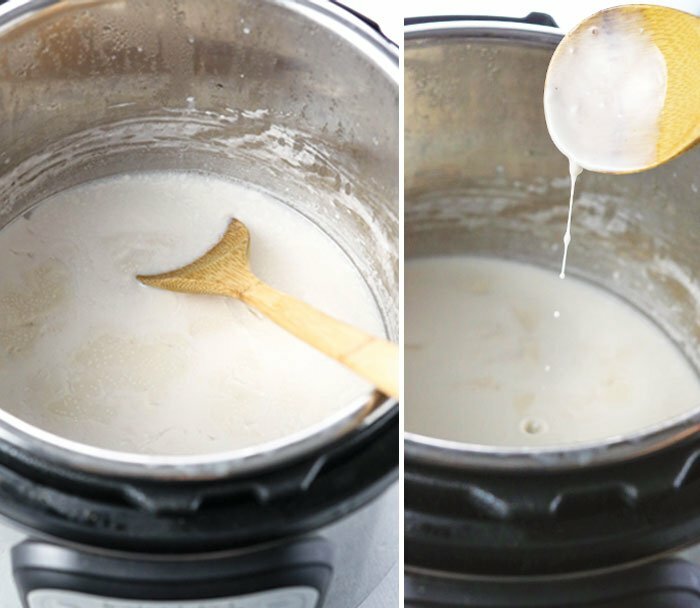 This INSTANT POT COCONUT MILK YOGURT is an easy and affordable dairy-free yogurt you can make in your electric pressure cooker. I love how thick it gets! Be sure that all of your equipment is sterilized by using boiling water or sterilizing your equipment in the dishwasher. This helps prevent bad bacteria from forming on your yogurt. In the bowl of your Instant Pot, combine the coconut milk and agar flakes and bring the mixture to a boil. (I press the Sauté button to do this.) Use a whisk to stir, helping the agar flakes to dissolve as the coconut milk boils. Once the milk has reached a rolling boil (or has reached 180ºF on your thermometer), turn off the Instant Pot and stir well, making sure all of the agar flakes have dissolved. Stir in the maple syrup, then let the mixture cool to 110-115ºF for proper fermentation, which feels warm to the touch without feeling like the temperature will hurt your finger. You can speed the process by placing the instant pot bowl in an ice water bath, but be sure that it doesn't cool too much. Use a thermometer or a clean finger to judge when the coconut milk has reached 110-115ºF. Once the yogurt has fermented, be sure to taste it to make sure it has become tart enough to your liking. The texture will still be watery and separated, with a possible cream-colored film on top, which is normal. (If there is a pink or gray colored film on top, that's a sign that the yogurt has gone bad and you should discard it in that case. When yogurt doesn't ferment correctly, it smells VERY bad and is nearly impossible to miss. Trust me on that one.) Pour the yogurt into a clean jar with a lid, and store it in the fridge to set. The yogurt will thicken when chilled. The coconut milk yogurt may separate a bit when stored in the fridge, so stir it well before serving. It can keep well in the fridge for at least a week, if not longer. If you don't have an Instant Pot, make this yogurt on the stove top. Simply bring the milk to a rolling boil on the stove top and dissolve the agar flakes by stirring with a whisk. Pour the mixture into a very clean jar, add the maple syrup, and allow to to cool to 110-115ºF. Stir in the probiotic powder, seal the jar with a lid, then wrap the jar in a towel to keep it insulated. Store it in a warm place, such as in your oven with just the light on. (Some ovens have an option to stay warm at 100º, if you have that.) You can also use a yogurt maker, a dehydrator, or a heating pad set to very low to keep your yogurt warm. Be sure the temperature doesn't exceed 115ºF or you'll risk killing the good bacteria. Just like the recipe above, you'll want to ferment the yogurt for 18-24 hours for the best tart flavor. Need more healthy Instant Pot recipes? 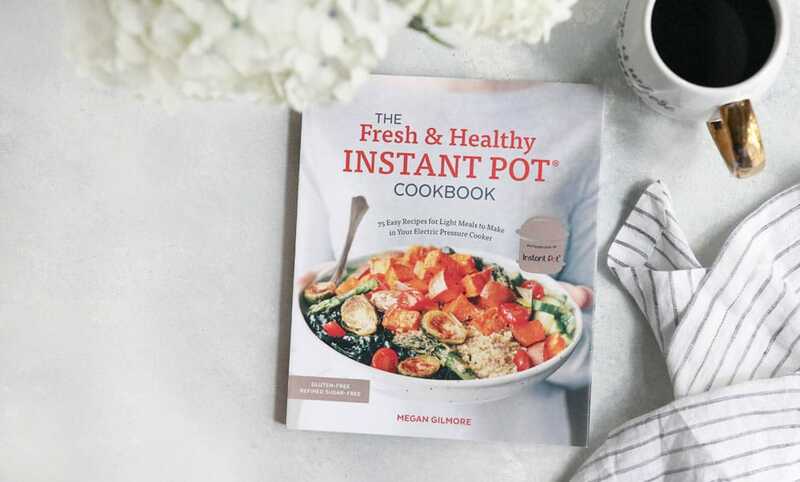 Be sure to check out The Fresh & Healthy Instant Pot Cookbook. You can see a sneak peek here! I tested this recipe using a bottle of store-bought almond milk, and I did not care for the results. (It wasn’t creamy, and had more of a jello-like texture from the agar flakes.) The fat in the coconut milk definitely contributes to the classic creamy yogurt texture, so other non-dairy milks will most likely not produce ideal results. (The same goes for the refrigerated type of coconut milk. The full-fat canned version and boxed culinary coconut milk produce the best results.) If you use the culinary milk to avoid using canned coconut milk, I’d recommend adding 1/2 cup of water to the pot before boiling, as this coconut milk is thick and a bit grainy. I hope you’ll enjoy this more affordable coconut milk yogurt. Let me know in the comments below if you give it a try! Reader Feedback: Have you tried making Coconut Milk yogurt before? Let us know in the comments below if you have any additional tips or tricks! We can all benefit from your experience. I had added 1 1/4 tsp Agar powder. hoping it’ll just fine. I did this recipe to the letter. My yogurt after cooling down was thinner than when I did 8 hours. Also I went to eat it this morning and it was very lumpy; put it away after whisking it; the smell was like sulfur; ate 4 tbs and now I am sick. Part of this bad experience could be I have a gallay kitchen and it has been in the 90’s this week. I used my instant Pot and in the past it never smelled and the taste is different than the past; I don’t know if it is the probiotics you suggested with the acidolpholus or the arrowroot I used. Unfortuantely I am giving up trying to make this. It isn’t working. and one last thing; I only did it for no more than 6 and 1/2 hours; otherwise it curdles my yogurt, the Instant Pot. Made it three times and it came out perfect if you like yogurt jello. I did the agar powder and first started with 1 tsp. it looked like yogurt jello; then even when I did only 1/2 tsp it still came out like jello. Maybe my coconut milk is not full fat?? what I do is put it in ablender or food processor for a few seconds and it comes out very thin and stays thin. I used the Instant pot and set it for 6 and 1/2 hours with the 1/2 tsp of agar powder. Maybe it is the milk itself or I need to use less agar. but I love it. There was a sort of speckled skin on top. It smells sour but I can’t definitely say bad. I wiped the skin off but am now wondering if it went bad? It’s normal for it to have a skin on top. In my experience, you can REALLY tell when it’s gone bad– the smell is almost nauseating. I made it, but it turned to liquid after the 18 hour mark; checked on it after 7 hours and it was thick; but I decided to follow the recipe. It was awful (bad probiotics or outdated.) Then I remember if I used a yogurt starter-1/4 cup of Liberte plain coconut yogurt, maybe I would not have to do the long fermentation. 6 hours later it came out thick; I did saute the milk and it was boiled to reach 180 degrees. I am so happy because now I have coconut yogurt and it was cheaper than using the probiotics. Thank you. Love love LOVE your site! After using your guidelines to attempt coconut yogurt in our sous vide, I just purchased an IP to give it a shot that way to compare results. This will be my first time ever using an IP! Using the agar powder and in the sous vide, it turned out grainier and not as tart as I like, so I’m experimenting with how to get my desired result. I plan to prepare it stove top because I want to test out 3 different thickening options (all using coconut cream, 1 with no thickener, 1 with agar powder and 1 with gelatin powder), so its not an option this time to go the easy route and throw everything in the IP bowl. If I do the traditional stovetop preparation, do you see any problem transferring everything into sterilized has and dropping them in the IP? Some recipes online say to put the lids on the jars and others say no lid necessary – do you have any insight? And will there be any problems to open the IP to taste along at different points in the cooking process? Sorry for the brain dump 🙂 Grateful for your guidance! How long did you culture it for? I’m in QLD and it’s always pretty warm here, so I usually only culture overnight in the summer. I don’t use any sweetner, and I’ve never had any “sour” yogurt. I “ferment” until there is a clear-ish liquid at the bottom of my container and then I put it in the fridge. What brand of probiotic powder do you use? This recipe is great! I’ve been using a yogurt starter packet but they are quite pricey. The probiotic powder would be a better option. I found your recipe quite helpful in making Greek style coconut yogurt. I did tweak it a little since I had a yogurt maker. I used three cans of coconut milk and followed your directions for the stovetop top part. I did not have agar agar flakes but the powder instead. However that 1tsp was enough to help thicken the coconut milk. I did add the 1TBSP of maple syrup and then the probiotic powder. I left the yogurt to ferment in my yogurt maker for 8 hours before storing it in the fridge. As a result I got delicious Greek style yogurt. I would love to try this but I have no idea what type of probiotic powder to buy. This is the only thing that is not explained. And an Amazon search is overwhelming. What did you use? My first attempt at making coconut yogurt in the IP and pretty great results! I used beef gelatin and raw honey. I would like it just a bit thicker but the taste is great! I used 2 tsp of gelatin so would use a little more the next time. So happy I found this. I love it! Thank you! Thank you for the recipe! if I want to flavor this vanilla for my daughter; what do you suggest? I was wondering if it is possible to make this recipe with a slow cooker using the function “keeping warm”? Aw, thanks for the kind words. I’m guessing the “keep warm” setting might still be too hot for yogurt. Anything over 110 degrees might kill the good bacteria. Could I use gelatin in place of agar agar flakes? Hi there! I’m just wondering if there is quite a tart odor with your yogurt. This was my first try with coconut cream over dairy and there was quite a strong tart/sour odor when I took it out after Incubation. The texture is good and the taste once sweetened with agave is quite nice but I’m just wondering if anyone else has noticed that there’s a really strong sour odor? I am so motivated to stop buying coconut milk yogurt in unsustainable plastic containers–and for what it costs to do so! Does this make a total of 6 1 Cup servings? The link embedded in your ingredients list doesn’t go to “cans,” but to 11 oz cartons. Did you use these, or cans of coconut milk? The cartons of coconut milk are supposed to replace 1 can in recipes, so I think they can be used interchangeably, although they result in a thicker yogurt because there is less water in them. The servings are for a 1/2 cup portion, so this recipe makes around 3 cups total. Does it matter that the culinary coconut milk is 11 oz, and canned coconut milk is 13 oz? The culinary coconut milk is more condensed with less water, so the resulting yogurt will just be thicker if you use that. I made this exactly as written (including sterilization, agar agar flakes, probiotics), and after 19 hours fermentation and 6 hours in the refrigerator (with some shaking of the jar periodically), I got an only slightly thicker version of the canned coconut milk. It’s slightly tangy, but not wholly.. It’s slowly pourable. I’ve read through all the comments, and your directions several times, and can’t figure out what went wrong. I have an Instapot rice cooker. Do you think I could make the yogurt in that? There are different settings for white rice, beown rice, steam and keep warm. I am a pro at making dairy yogurt in the IP, but this will be my first time making non-dairy. I have some questions based on having made dairy yogurt: 1. Can you use store-bought coconut milk yogurt as a starter culture, or does that not work like it does for dairy yogurt? 2. Why does it need the maple syrup to ferment? If you skip the maple syrup, it won’t make yogurt? Thank you for posting a recipe without gelatin, most of the ones I have found contain gelatin. Can you tell me what kind/brand of probiotic to use and where to get it? Just made this over the weekend, am ordering a yogurt maker as I used the lights in my oven for 24 hours to get a perfect temp. The yogurt is so tasty, I can’t wait to experiment with more flavors. I will always use the coconut milk for the base, so yummy. I did make the mistake of using agar agar powder, a whole tablespoon, oops, I have jello yogurt but the taste is sour and simply heavenly. Can’t wait to see how much money I save from the store bought yogurt. Thank you for this amazing recipe. Can I use some scoby from my kombucha brew, in place of the powder? I accidentally used 1 TBSP of Agar POWDER instead of the flakes. It was pretty solid when done. However, running it in the food processor made it perfect! Just like Greek Yogurt! I have an “Ultra” version Instant Pot. The Yogurt setting has many temperature choices. Should I use the “medium “ setting? It say “107 degrees”. Hi!! I just found this recipe and I wonder what brand of probiotic you use. I have one with 25 billion CFU. Doe´s this works? i’ve been into flaxmeal milk lately. is it possible to make vegan yogurt with that milk? I tried making it with almond milk and agar, and the result was more like jello than yogurt. I like the coconut milk better personally, but you could experiment with it! You really only need to cover the yogurt– it won’t come to pressure, so it doesn’t really matter if it’s locked/sealed, but I feel like covering helps protect it from dust, bugs, and other things that might float into during the fermentation time. After refrigeration, the top of the yogurt solidified but the bottom was liquidy. What do you think happened ? It tastes like fermented coconut yogurt – I blended the fatty solidified parts with an immersion blender and put it back in the fridge. Maybe that will work to thicken? Yes, I’ve had to do that before, too! After blending it tended to stay more emulsified. I find that the So Delicious culinary coconut milk doesn’t separate as much, so it varies by brand. This turned out fantastic for me! I added 2 tsp of agar powder when heating the coconut milk and used a vegan culture starter. I fermented in my food dehydrator for 18 hours at 110F. After refrigerating, it did have a gelatin texture, but I just threw it in my vitamix and blended to a smooth and creamy texture. After sitting in the fridge for a few hours more, it has a Greek yogurt texture to it. So happy with how this turned out. Which vegan starter did you use? I’ve made this twice now & it was delicious. One time, it was a bit grainy & I think the difference was that I used a fork to mix it instead of a whisk as you noted above.. I think it really needs some rapid whisking to keep that smooth, creamy texture. Thank you for the wonderful recipe! I’ve now shared it with quite a few people as well. I use 1 tea spoon of agar agar powder and it worked perfectly. It tastes better than the store bought version. Thank you! What is the least amount of time you can ferment the yogurt? 18 hours? Don’t like so much tang in my yogurt. I think you could do it for 8 hours! I have 2 cans of coconut crea (Thai Kitchen brand). Do you think that these would work instead of the full-fat coconut milk? oops, not coconut crea, but coconut cream. I used 1 tsp of Vital Proteins Grass Fed Beef Gelatin. It worked but its a bit thin. I’ll do 2-3 tsp next time. Very good. One thing I should have done was keep shaking it after I put in the fridge every 20 mins or so. The coconut milk separate and I am some harder fat chunks in my yogurt. Great recipe though! Is there a specific reason you can’t use agar agar powder instead of flakes? I wasn’t able to find the flakes at my local asian store – only the powder. The measurement will just be different for powder– it’s a lot more concentrated than flakes, so you will need to use less! I’ve read that you should use 1 teaspoon of powder to replace 1 tablespoon of flakes, but I’ve never tried it myself. Let us know how it works for you! Is it possible to do this using strictly the yogurt function on the IP? Is the initial boiling process necessary? The yogurt function on the IP is designed to have you boil the milk first, it just doesn’t work well. (You hit the yogurt button then hit the up arrow to get the “boil” message on the IP.) So, technically the boil is part of the yogurt function, and it is recommended to make sure you don’t get bad bacteria in your batch. That’s only happened to me once, but it made my IP smell REALLY bad for at least a week!! I did use the yogurt function’s “boil” setting several times, and even though my milk didn’t boil, the yogurt turned out well. Totally up to you if you want to risk it or not! I’ve made several types og yogurt in the IP but in mason jars. The yogurt function is not meant to boil. It just warms the yogurt so that the bacreria ferments. I think in your recipe maybe you need to boil for the agar to thicken. I’m looking forward to trying the agar to get a thicker consistency without having to use coconut cream. What is the difference in using the agar powder vs flakes? Sounds great, it’s on my To Cook list for next weekend!! Do you think it’s possible to freeze the yoghurt? I’ve never tried freezing it, but since it has a high fat content I think it would freeze very well. Research has shown that certain beneficial bacteria can survive freezing for up to 11 weeks, so I wouldn’t freeze it longer than that if you want the probiotic benefits. Can you swap the maple syrup for honey? Have you tried this with konjac powder/ glucomannan instead of agar flakes? I’ve been using the glucomannan with great success, but not fermenting, just thickening. I would love to hear your thoughts. Do you think this could be doubled or tripled. We have a large family and use alot of coconut milk yogurt. I haven’t tried it in the instant pot yet. Usually do stovetop and dehydrator. Do you find this works with the can of coconut milk that contain guar gums? Our local stores ONLY have that option. I think Trader Joe’s is coconut milk only but that’s an hour driven1 way with two kids. Yes, I think almost every brand I tested contained some sort of additive like guar gum, and they turned out well for me! The only one that didn’t work well for me was the boxed coconut milk found in the refrigerated section. Can you use a yogurt maker to do this? Oh my dear, you are a genius! I’ve been struggling with even attempting coconut yogurt in my Instant Pot since I really couldn’t find any good guidance on the internet. I’m so excited to try this. We really love and rely on yogurt for breakfasts, but we cringe at animal milk. So we’ve been buying the expensive coconut version and not feeling good about the price or the ingredients. I can’t wait to try this! Now, if I could just perfect coconut kefir or some other kind of non-dairy kefir. I know the probiotic power is so much better. Any change you will be trying that? Thanks again for all you do! THANK YOU for sharing this recipe! I’ve been dying to try making my own coconut milk yogurt at home, but I’m intimidated by the fermentation process. I just made this yesterday after work, and I checked on it this morning– it turned out perfectly. So excited to save money on my yogurt! I will have to give it another shot. This is my 2nd time trying in my Instant Pot this but I used whole milk first time both times I’ve been unsuccessful. Oh, darn. The probiotic powder or yogurt starter is definitely necessary for good fermentation, so I hope you’ll try it again with good results! What brand of probiotic powder did you use?, can’t wait to try this. I’m also curious what type of power you use? My local health store only has capsules. Frantastic! I didn’t know instant pots could ferment. Can you use yogurt starter instead of the probiotic powder? I tried a different coconut milk yogurt recipe that called for the starter. I’m anxious to try this in the IPot! I have a vegan yogurt starter from Cultures for Health. Can I use that in place of the probiotic? Yes, I image the yogurt starter would replace the probiotic just fine! I would follow whatever directions comes with your package, in case a starter needs something different in terms of amount of liquid or sweetener. I can’t tell if the grainy texture comes from the fat molecules in the coconut milk solidifying when chilled, or if it’s a grainy texture from blended coconut (the way coconut butter has a similar grainy texture.) Let us know if you try straining it! I think my son still prefers the goat’s milk yogurt because it’s smoother. I was able to make the texture much smoother by using agar agar and tapioca starch. 2 parts agar agar to 1 part tapioca starch. I make my own coconut milk for yogurt and using the above yielded a smooth thick texture. Tapioca starch alone was lumpy and agar agar alone was grainy. The two combined was perfect in my opinion. This looks so good! 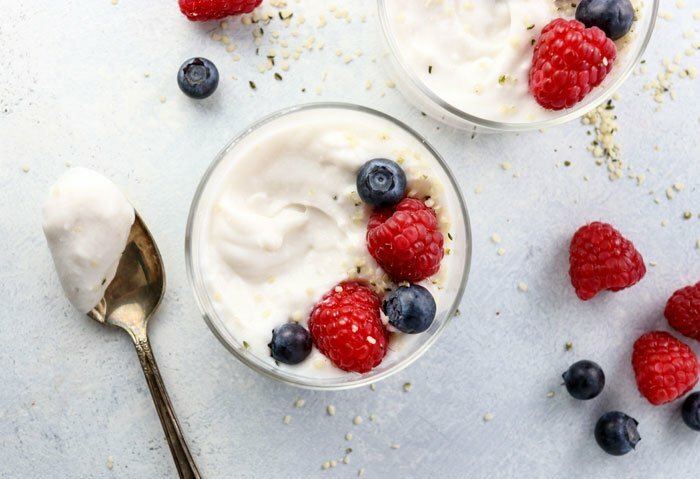 While we eat a mostly plant-based diet, we all love yogurt. I buy the non-dairy kind for my husband and go for goat’s milk yogurt for myself and my kids. But you are right, the non-dairy yogurt is very expensive and not so healthy. This might be a good option for all of us. 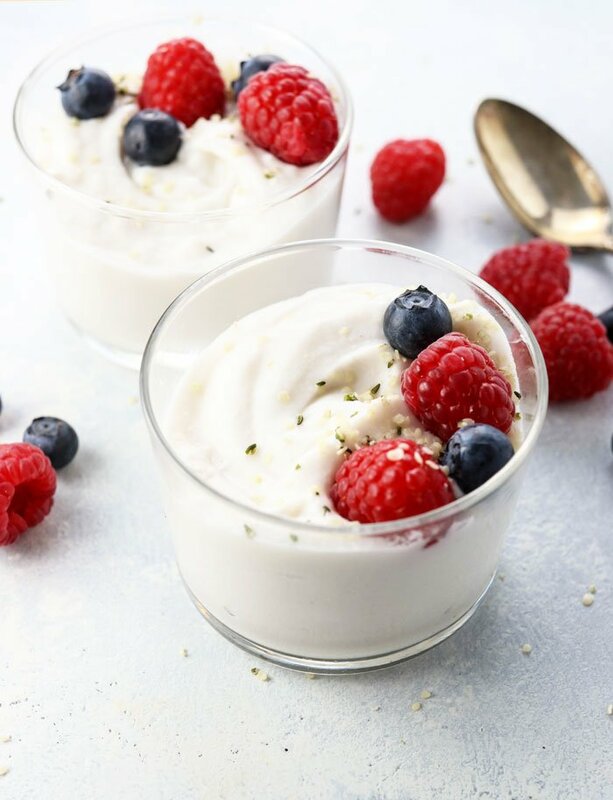 Before adopting our plant-based way of eating, I often made homemade yogurt to great satisfaction using my crockpot and I may give that a try with this recipe. Thanks for sharing!